This conversation on cleaning pet messes was sponsored by Hoover. View our complete disclosure policy here. 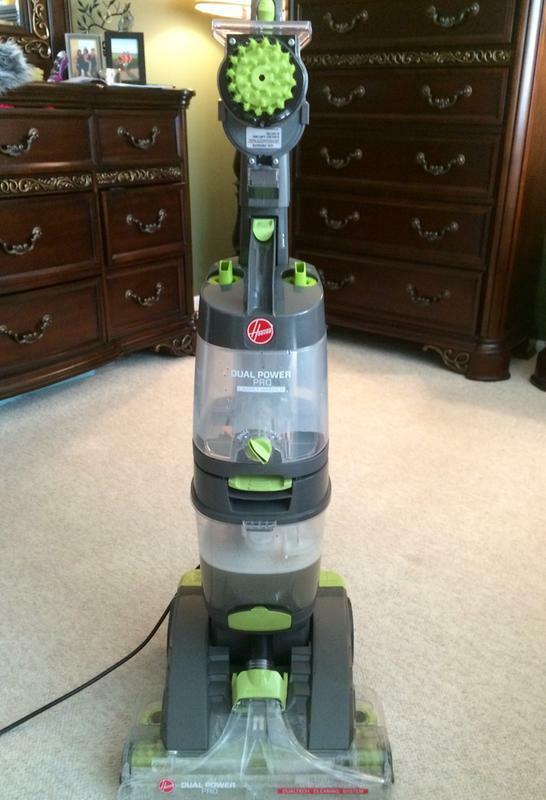 The Hoover Dual Power™ Pet Premium™ Carpet Cleaner means business. This is a heavy duty carpet cleaner, with serious scrubbing potential. Its DualTECH™ Cleaning System features patented SpinScrub Brushes and a rotating brushroll which work to clean years of dirt and stains out of your carpet. The Dual Power™ Pet Premium™ Carpet Cleaner comes with a Complete Accessory Tool Pack, which makes this carpet cleaner an all-in-one carpet, spot, and upholstery cleaning machine. The Complete Accessory Tool Pack comes with an 8′ hose, upholstery tool, 360 degree SpinBrush Powered Hand Tool, Spot-Treater Wand, and a mesh storage bag. The Upholstery Tool is great for use on upholstered furniture such as couches and chairs. 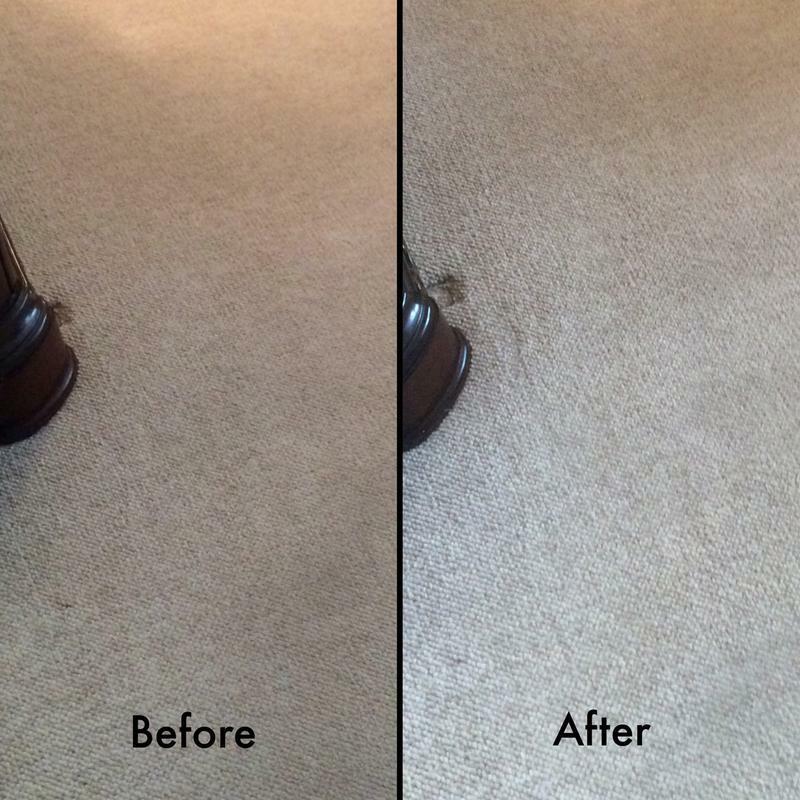 The Spot Treater Wand mists carpet with cleaning solution for a pre-treatment. The 360 degree SpinBrush Powered Hand Tool has a rotating brush that is great for use on small areas of carpet such as stains or pet stains. 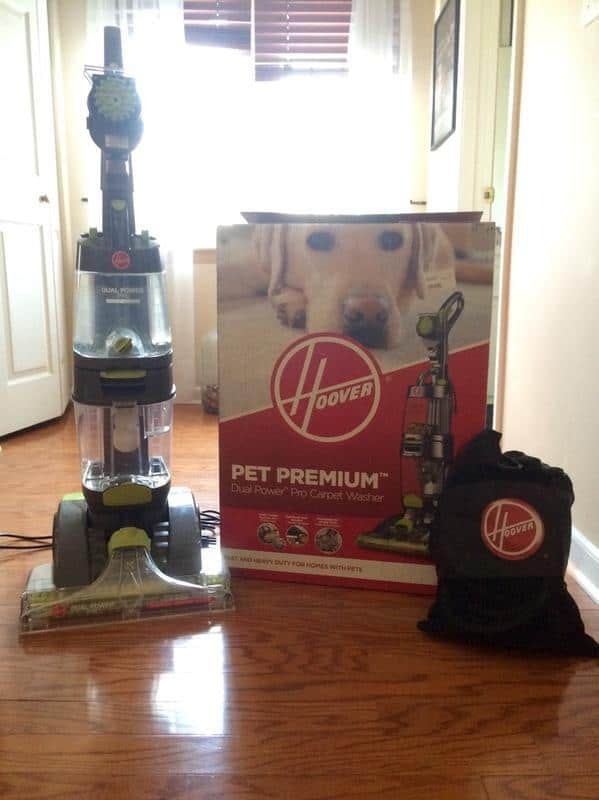 My Dual Power™ Pet Premium™ Carpet Cleaner came with 16oz bottles of Hoover Pro Plus 2x Concentrated cleaning solution and Hoover Pet Plus 2X Concentrated cleaning solution so we were able to get started cleaning right away. As soon as we unboxed this baby we went to town on our bedroom carpet, which we considered to be pretty darn clean. We were shocked when we saw all the nastiness that this bad boy pulled out of the carpet! The large 1 gallon tank and 15″ wide path nozzle helps me to power threw carpet cleaning quicker than with any other carpet cleaner that I have ever used. It simply covers more area in less time, and has be making less trips to refill the water tank. My carpet even dries faster thanks to Heat Activated Drying. Weighing in at 20 pounds, the Dual Power™ Pet Premium™ Carpet Cleaner is heavy and therefore not fun to lift and carry… especially up and down the stairs. But, once I get carpet cleaner where I want it, it is easy to maneuver around the room. 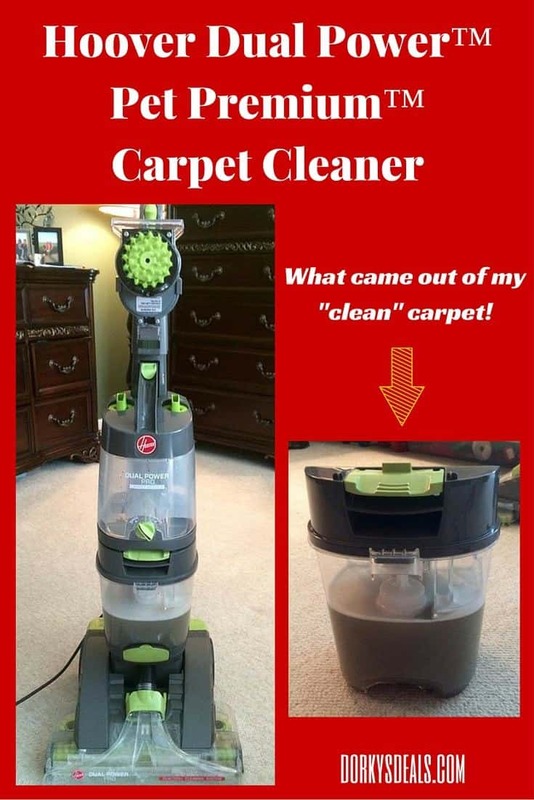 Thankfully, the Dual Power™ Pet Premium™ Carpet Cleaner comes with an 8ft house which helps to reach stairs without having to hold the carpet cleaner on the staircase. The combination of pre-treating with the Spot-Treater Wand and scrubbing with the 360 degree SpinBrush Powered Hand Tool is perfect for cleaning up the little messes that out cat leaves us around the house. I love this carpet cleaner, and I think that it is perfect for a family with pets, such as ourselves. I really appreciate the fact that this is an all-in-one machine, and comes with everything we need to get started cleaning our carpets, upholstery, as well as spot cleaning kitty messes. I am happy with the Hoover Dual Power™ Pet Premium™ Carpet Cleaner and would recommend it to pet owners without hesitation. Update: I have discovered that this terrific carpet cleaner is no longer available. 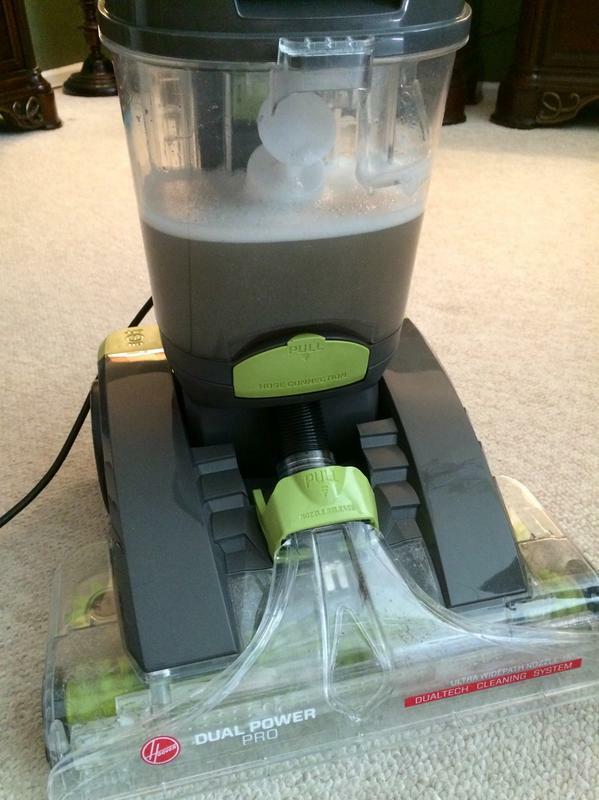 I took a look at reviews of similar pet carpet cleaners, and the Hoover PowerDash Pet Carpet Cleaner looks like it would be the current brest choice of carpet cleaner for pet owners. I want this! I have been worried because I seen one kind have to be sent back to manufacturer because the dog hair was not cleanable from bottom and clogged it. It was not a pet type though. It is so important to have a good vacuum cleaner when one has pets. Looks good for non pet owners too. This would really help keep all that pet hair under control. This is something I could really use with 2 cats and a dog in the house. It looks like it has a big tank on it too. i really need a new cleaner. this sounds like it would be great for my house. i have 3 dogs and they have lots of accidents.